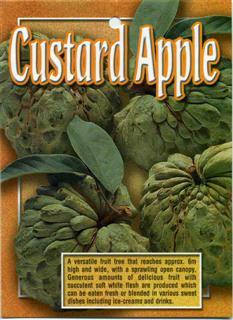 Has the delicious and melting taste of the sugar apple which makes it one of the most popular of the custard apples. As the name suggests the virtually seedless fruit is one of the largest. Top marks for quality, however a lower yield than the African Pride. Pinks Mammoth has a very large fruit size and high fruit quality. It is named after Mr Pink, the man who introduced it to Australia. When mature the tree produces significant yields. So far so good. I found some of this variety on sale at Rusty's Bazaar in Cairns. I told the grower I thought it was too low yielding for commercial use. 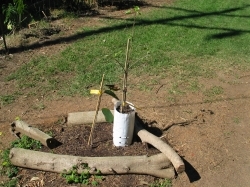 He suggested a heavy pruning with removal of all leaves in autumn, dynamic lifter in spring and fertilizer when buds appear, followed by hand pollenation. It is December and the tree looks healthy, waiting for flowering. good looking tree likes to grow out it is over 4m wide even with pruning have not been able to get much growth in height. Comments: - Planted by my grandfather in 1950. Quality of fruit far superior than African Pride. I've had this tree for a couple of years, but it has been moved a couple of times, so has stayed quite small, as it has not been able to become established. May even have to be moved again as I think it will get too big for this position. It has lost all it's leaves so now would be the perfect time. Planted the tree abount 5 months ago. It had 7-8 leaves initially. Now it's down to 2. Hoping for new growth as the weather warms up. The tree next to it in the bag is the persimmon I just bought. An update - after 2 1/2 years, still no fruits, no flowers. Meanwhile I have planted the persimmon which flowered and fruited, though the fruits dropped when the size of a cherry tomato. I'm thinking of digging it up and plant a new one!